Whether you are a long-time record player enthusiast or have recently sparked an interest in these retro music players, you will be able to find an extensive assortment of turntable models for sale. Not only do record players come in numerous different makes and models, but there is also a wide range of brands to choose from. Jensen is one such turntable manufacturer. Founded in 1927, Jensen is a long-standing and trusted company, providing outstanding audio products for consumers everywhere. In this record player review, we will assess the JTA-230 3-Speed Stereo Turntable from Jensen. This top-notch record player is a customer favorite, and may just be the product you are looking for. There are multiple characteristics of the best record players that you should keep in mind as you shop, as well as requirements that will be specific to your needs. To begin, consider different turntable operations. Record players on the market today use either belt-drive, direct-drive, or digital systems. The belt-drive operation is an earlier invention involving an elastomeric belt which spins the record. The viscous material of the belt absorbs vibration from the motor and helps clarify the record’s sound. Direct-drive systems simply use the power of a motor to move the turntable. The third operation type is digital, which normally involves volume and speed control, along with digital readouts. This form of operation can be built into other systems. Other criteria to take into account are the compatible rotational speeds for the turntable, and whether it is manual, automatic, or semi-automatic. Modern record players are categorized as 2-speed or 3-speed. 2-speed models can play 33 ⅓ and 45 RPM. 3-speed options can accommodate an additional speed of 78 RPM, which is required by vintage records. Manual turntables are vintage as well; these players require the user to place the needle on the record and then remove it manually. Automatic players complete these actions with the push of a button. Semi-automatic models are a combination of the two: the needle must be placed by hand but is removed automatically. To conduct a complete record player review, we need to consider the product’s sound system. Even contemporary products vary greatly in this area. Some turntables come with an internal speaker system. While the included sound systems of top-caliber machines can be strong enough to deliver a satisfactory listening experience, other models require an external device. Record players that connect to your own stereo or amplifier can often deliver superior sound quality. The Jensen JTA-230 is a sensational value, with top-of-the-line technology and progressive features. The belt-driven turntable is 3-speed compatible and includes pitch, tone, and volume control. Built-in speakers enhance the product’s convenience without compromising its portability, as the JTA-230 weighs just 5.5 pounds. This Jensen bestseller provides the user with the ability to convert records into digital form with a USB port and cable. In addition, software for recording, editing, and conversion to MP3 is included. You will be able to connect your iPod, MP3, or other digital music devices to this record player using the auxiliary input jack. RCA line-out jacks and a stereo headphone jack are also built into the system. The JTA-230 sports a modern design with a sleek, black exterior, as you can see in the Amazon.com image provided below. The turntable offers ease of use with clearly labeled auto stop and power switches. The output jacks and tone and volume dials are also easily identifiable on the front side of the product. This Jensen turntable combines simplicity, affordability, and functionality to create a well-rounded product. The Jensen JTA-230 is one of the best record players around when it comes to convenience and affordability. This Jensen turntable may be the best option available for those looking for a wide variety of features within a budget. Included speakers and 3-speed record accommodation make the JTA-230 appropriate for a range of needs and uses. The only downfall in this product’s functionality is its automatic stop switch, which halts the motion of the arm but does not return it to the resting position. Unless you are specifically looking for an automatic turntable, this will only be a minor inconvenience. The inclusion of a USB port for digital conversion is a benefit usually found in products selling for double or triple the price of the JTA-230. Also, the supplementary recording and editing software is an exceptional addition to this Jensen turntable and broadens its digital music capabilities. An auxiliary input, RCA line-out jacks, and a stereo headphone jack allow you to connect other devices to the turntable and further increase its advanced facility. The JTA-230 contains the convenience of an internal sound system with a built-in stereo. Keep in mind that this model weighs under six pounds, so the power of the sound system is limited. Determine what you will require when it comes to sound projection, and consider using an external sound system via the RCA jacks if the small built-in stereo is not enough. The Jensen JTA-230 has it all: sweeping connectivity options, included digital music software, capacious sound control, and the ability to play three different record speeds. 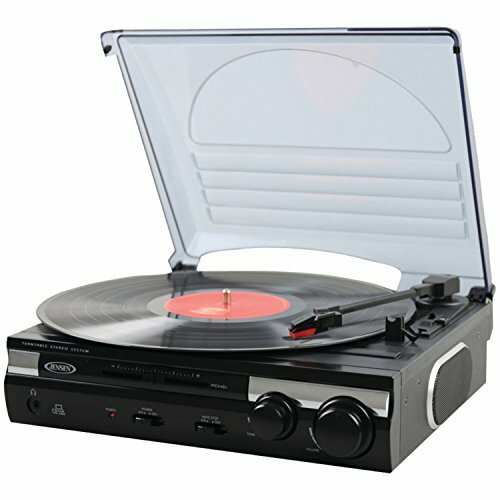 This Jensen product is even recognized by Amazon.com as one of the best vinyl record players available. If you are looking for an easy-to-use turntable with technically advanced features at an affordable price, look no further than the JTA-230.